The handstand is one of the most challenging and versatile skills in acrobatics. In our classes, we practice techniques for developing strength and flexibility in order to help you build your handstand in a way that is healthy for your body. 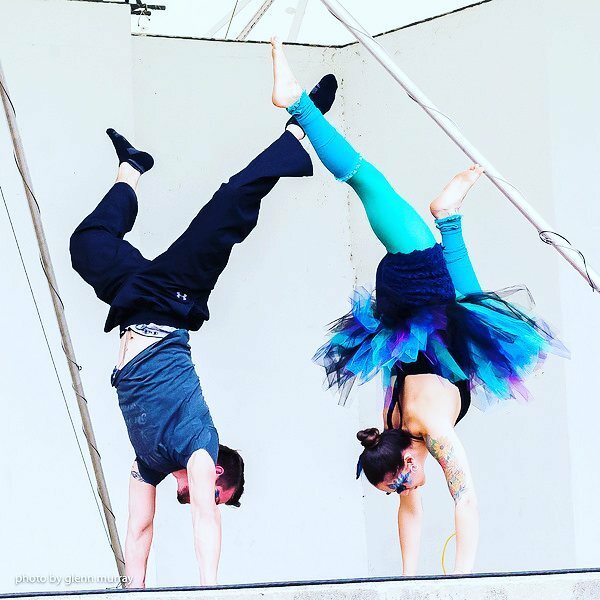 Our classes integrate the study of hand balancing yoga poses, calisthenics, anatomy, and partner work. Whether you are comfortable in a handstand, or if you have no handstand practice at all, this class will help you take your hand balancing to the next level. If you are able to kick into a handstand but can't hold it for more than a few seconds, finding your alignment may be the key to feeling truly balanced on your hands! Our classes are influenced by a background in yoga, which teaches us how to listen to our bodies, breathe, and find stillness in these difficult poses. We also incorporate calisthenics to build strength and stability in key muscle groups. After a warm up, we work out with excercises designed to improve strength and flexibility in the wrists, shoulders, and core. Sometimes we use props like blocks, canes, and resistance bands to help maximize the work we do. You do not need to be able to do a handstand to take this class- that's what we're here to teach you! If you CAN do a handstand, we will make sure you receive a work out that challenges you and helps you improve, no matter what level of difficulty is right for you. Pre-requisites: 10 second front plank. Healthy joints and muscles. Willingness to spot and be spotted. This class may be done barefoot or in socks. No shoes. Wear clothes your feel comfortable going upside down in.